The Truman State University SIFE team was recently named the third place winner at the ConocoPhillips Ethics Case Competition held in Manhattan, Kansas February 2 – 4. The event was developed and hosted by Kansas State University SIFE Team. Along with a third place plaque, the team also received a check for $1000. 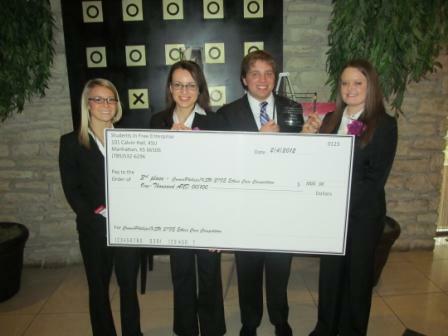 The Truman State SIFE team plans to put this money right back into the projects that they are planning. Every year the team organizes and puts on numerous projects that benefit the University, local community, and surrounding area. Every penny goes back into the work being done to help those who need it most. In this competition, participating students had 36 hours to utilize their business skills for analyzing, researching, and developing a solution to a case about an ethical dilemma. After developing a solution, they created a professional presentation which included a verbal script, visual slides, and a written executive summary. The presentations were evaluated by business leaders and university faculty serving as judges for the event. The culmination of university coursework and extracurricular events such as this case competition, provide a forum for college students to utilize their educational knowledge and skills about ethics in a structured and formal environment. .